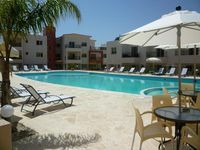 Properties in Cyprus average 4.6 out of 5 stars. Property 23: Perfect location, south facing private pool, air con, TV & WiFi. Villa With Amazing 10 M X 5 M Infinity Pool, Free Wifi, In A Quiet Village. Property 30: Villa With Amazing 10 M X 5 M Infinity Pool, Free Wifi, In A Quiet Village. Property 40: Outstanding Sea and Hill Views, close to several beaches & restaurants. Luxury Villa with Heated Pool. Walk to Beaches and Grecian Park Hotel. Wi-Fi. Property 43: Luxury Villa with Heated Pool. Walk to Beaches and Grecian Park Hotel. Wi-Fi. The private garden was lovely, pity it was to cold to sit out and enjoy. Comfortable apartment with all you required. Could do with some kind of sound proofing. Would recommend this apartment.